Giant Pump Pressure Washer Trigger Spray Gun: Jack's is your Place! We have the Pressure Washer Trigger Spray Gun you need, with fast shipping and great prices! 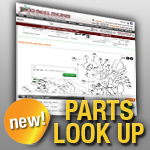 For pressure washer parts and accessories, think Jack's!